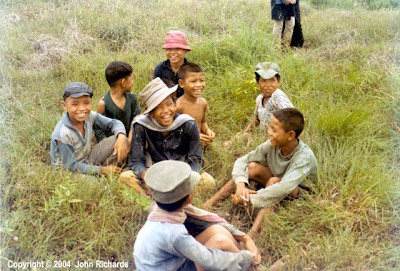 I never put anything on this blog about my time spent in Vietnam but here are some memories from a long time ago. I took all these photos. Except the first one shown. If you want to learn more about the caribou check out our organization The C7a Caribou Organization and learn about the missions the Bou flew. 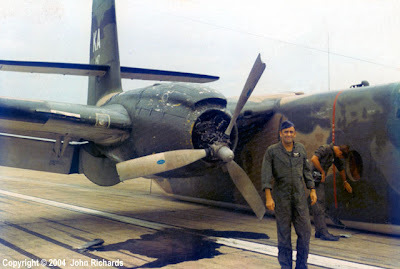 I was an Aircraft Electrician in the 483rd CMS Squadron from November 1970 to November 1971. I worked at Cam Ranh, Bien Hoa, and Can Tho. 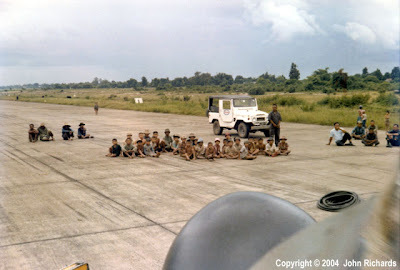 I spent a lot of time at Bien Hoa and did a lot of field trips to repair broken aircraft. Some of the photos, below, are from one of the more memorable of those field trips. I also did a lot of morning launches, riding around in the maintenance launch truck, helping to blow out mags and get engines started. 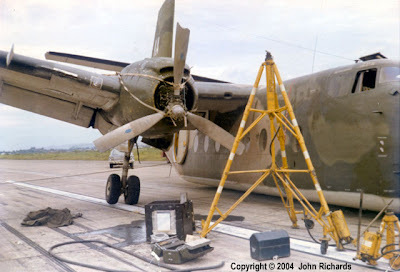 Working on the Caribou was a great job, and the guys I worked with in country were the best. 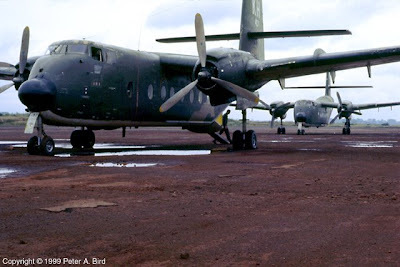 Some of the places the caribou flew were really isolated and doing any type of field maintenance in the field was challenging at the best. But we always seemed to get the work done. I can really say we jury rigged a lot of stuff just to get the aircraft back to base. I remember working on a starter problem at a place called Song Be, up along the Cambodian border. There was no maintenance stands to work with, so I used a 55 gallon drum to stand on. It was a weird problem as the starter lead was just not making contact with terminal stud. An infantry officer came over to me and was asking in a round about way of how long was it going to take me to fix the aircraft and get this “MORTAR MAGNET OFF HIS BASE”. Well as dark was approaching my incentive to get the aircraft fixed was doubled. Anyway I fixed it by squeezing the terminal lug with some water pump pliers. Power got to the starter the engines started and me the two pilots and an engineer were happy and flew back to Bien Hoa. And so was the grunt officer! 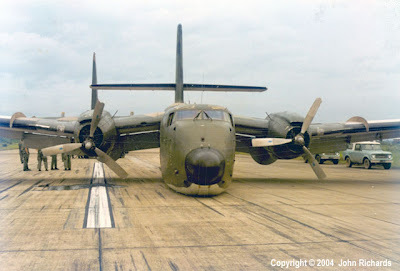 KA147 (62-4147) on the runway at Chang Mai, Thailand without use of the landing gear. 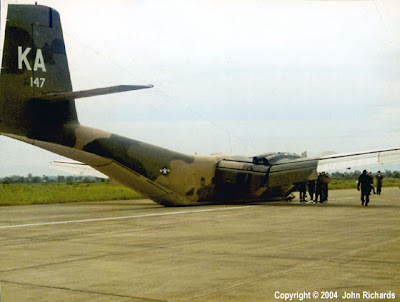 The scuttle buck was that the overhead hatch blew open during the takeoff and the pilot set the aircraft back down on the long runway, forgetting that he had already retracted the gear. Summer 1971. 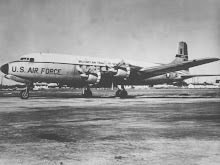 Some of our missions was to fly to different diplomatic spots in Thailand. Chang Mai is in Northwest Thailand, a very beautiful place.The only other aircraft Isaw there were Air America Pilatus Porters. Its good the Bou had a flat underbelly. There really wasn't much sheet metal damage. 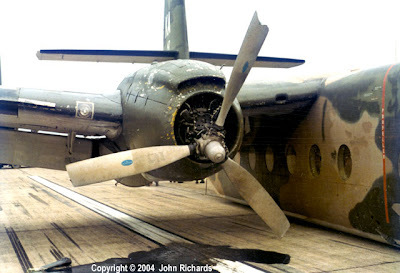 The major damage was done to the engines and the props as can be seen here..Sudden stoppage of the engine is not good. Actually some the prop was sent through the fuselage. We worked all day getting the aircraft back on its gear. As can be seen we used air bags and jacks. We had to tie and strap the props on so they wouldn't fall off. The nose box on the engine was completly wrecked. 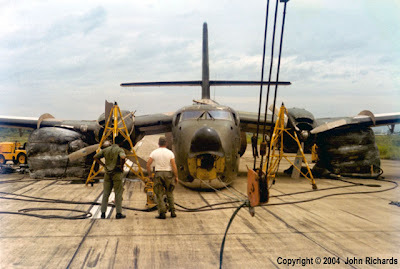 Once the aircraft was up on its gear we towed it to the ramp and worked on it for a couple of days changing both engines and doing some sheet metal work. We then flew it back to Bangkok and then on to Cam Ranh Bay were it was checked over. This was a gravy job as it was out of Vietnam and in Thailand, so we tried as hard as we could to extend this TDY trip. It was the best trip I had in Southeast Asia. This is our Operations shack at Bien Hoa, Vietnam. 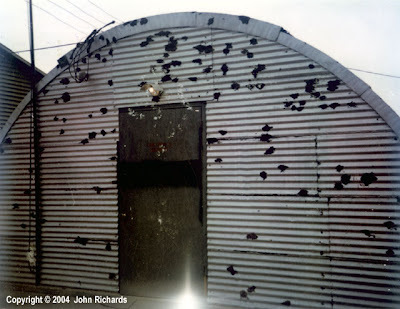 The black tar spots are holes from a 122mm rocket that hit in front of the shack about an hour before the guys would arrive. 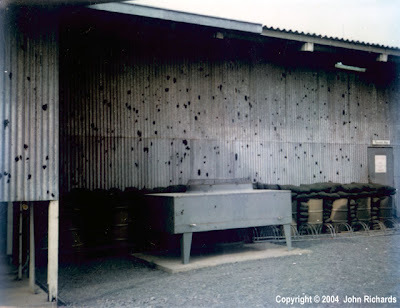 At Bien Hoa we took a lot of Rocket and mortar attacks. 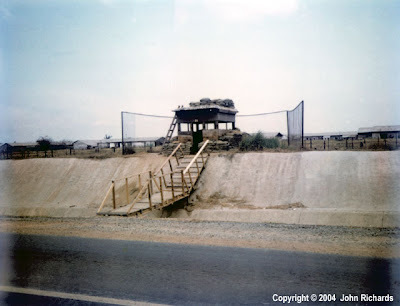 One of the Bunkers at Bien Hoa on the east side of the base.